↑ ୨.୦ ୨.୧ Harper, D. "Elephant". Online Etymology Dictionary. Retrieved 25 October 2012. ↑ Lujan, E. R.; Bernabe, A. "Ivory and horn production in Mycenaean texts". Academia. Retrieved 22 January 2013. ↑ "elephant". Palaeolexicon, Word study tool of ancient languages. Retrieved 19 January 2013. ↑ Kalb, J. E.; Mebrate, A. (1993). Fossil Elephantoids from the Hominid-Bearing Awash Group, Middle Awash Valley, Afar Depression, Ethiopia. The American Philosophical Society. pp. 52–59. ISBN 0-87169-831-5. Shoshani, J., ed. (2000). 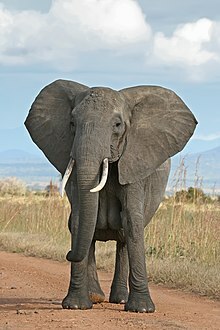 Elephants: Majestic Creatures of the Wild. Checkmark Books. ISBN 0-87596-143-6. OCLC 475147472.